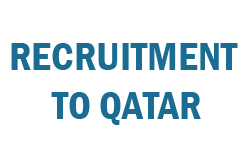 Job Location: Qatar, Qatar is a peninsular Arab country whose terrain comprises arid desert and a long Persian (Arab) Gulf shoreline of beaches and dunes. Also on the coast is the capital, Doha, known for its futuristic skyscrapers and other ultramodern architecture inspired by ancient Islamic design, such as the limestone Museum of Islamic Art. The museum sits on the city’s Corniche waterfront promenade. Required for the below vacancies.